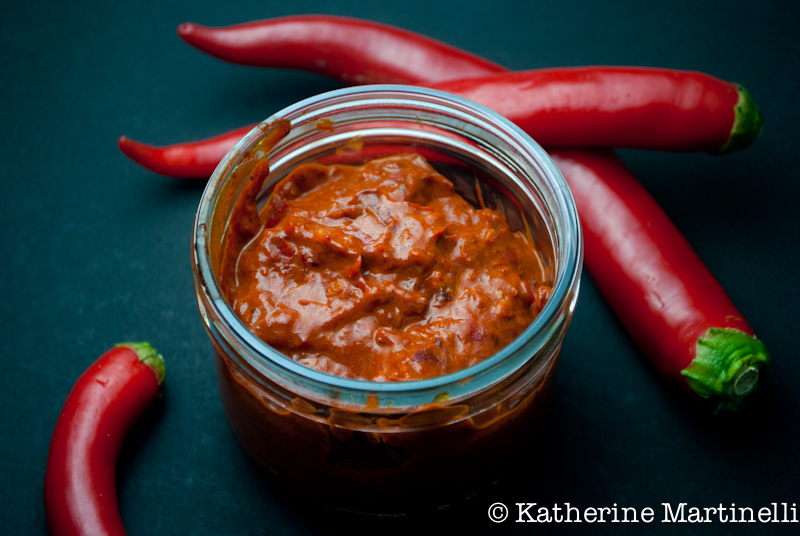 This is one of those things that’s been on my list to make for a long time: homemade harissa. The fiery, vibrant red, North African pepper hot sauce is completely addictive and revs up anything you add it to. Stews take on new depth, dips get kick, and tagines will never be the same. Popular in Tunisia, Algeria, and Morocco, harissa has also become a hip flavor in the States where you will find harissa aioli, harissa-marinated steak, harissa grilled shrimp, and harissa oil. I consulted a number of recipes before making my own. Some call for roasted red peppers, but from what I could find authentic harissa sticks with dry hot peppers. The recipe at Serious Eats is a good basic harissa, but calls for roasted red peppers, which I’d decided against, and ground spices. My research also indicated that toasting whole caraway, coriander, and cumin seeds then grinding them would result in a much more flavorful harissa. Also, various sources emphasize not to leave out the caraway seeds. Although the amount is small, they leave a subtle but perceptible flavor. The recipe at Saveur is quite good, and close to what I ended up making, but called for dried mint, which I wasn’t interested in. The New York Times offers another great rendition, but omits the lemon juice, which I just couldn’t live without. America’s Test Kitchen offers some great tips to go by, but no recipe unless you are a subscriber. And Yotam Ottolenghi’s recipe in Plenty is quite excellent, like all of his recipes (I’m obsessed) but calls for red bell pepper and onion, which I wanted to do without. And do check out Winnie’s amazing version over at Healthy Green Kitchen – doesn’t it look amazing? So, what was I looking for in a harissa? I wanted to use a variety of dried peppers, and ended up going with 1 ancho chili, 10 small dry hot chili peppers, and 6 large mild ones (they look like puya peppers but I’m not 100% sure). I wanted to use whole spices, toasted and freshly ground. I wanted garlic, olive oil, lemon juice for brightness, and tomato paste for some extra concentrated flavor as well as great texture. I added in some fresh roasted hot chili peppers too, just for fun. And the result – incredible. Layer upon layer of flavor. I wanted to eat it with a spoon, and did. The heat builds, rolling to the back of your tongue and settling in your throat with a pleasant, but not overbearing, spice. If you need ideas for how to use it stay tuned for Monday’s post. I’ve got an incredible recipe coming up for you plus lots of ideas on how to put your homemade harissa to good use. This week’s blog hop is all about peppers and I can’t wait to see what you have to share! Last week’s breakfast blog hop was a huge success with over 65 amazing recipes linked up. I created a Pinterest board to share the recipes, which you can follow here. And I’ve got a pepper board ready and waiting here! Thanks as always for stopping by and sharing your recipes. Make harissa - a fiery, North African hot sauce - at home and you'll be adding to everything from dips to stews. Use different types of peppers to adjust the heat from mild to blowing out your ears. Put the dry chilies in a bowl and cover with hot water. Soak for 30 minutes to 1 hour. Put the fresh chili peppers on a baking sheet and roast 20 minutes, or until lightly charred. Remove from the oven and put in a brown paper bag or wrap in paper towels to cool. Scrape away charred skin and roughly chop. Lightly toast the caraway, coriander, and cumin seeds in a hot pan until aromatic, about 3 minutes. Grind in a spice grinder. Put all the ingredients in a food processor and pulse until well combined and smooth. Store in a glass jar in the fridge for up to 1 month. This recipe looks so much better than the canned variety that I’m slowly using up. I’ll definitely have to give this a try. Your photos are just gorgeous! As always, you photos are fabulous. Love the red on black presentation.I think Harissa is a little too hot for me, but I will actually be posting a recipe soon that uses it. I linked 2 recipes. Quinoa and black bean stuffed peppers and a stuffed pepper recipe made from raw nut ingredients. Thank you so much Judee! And thanks for linking up, I love the recipes! Huh, I’ve never had harissa. It sounds wonderful, though! Your recipe looks great, I’ll have to make some. Thanks afor the invite to the blog hop, as always! Ooooh, I bet that will take a layer off your mouth! Not a big “heat” fan but I love the flavors of peppers, so I usually go light on the heat or use my favorite, red bell peppers. Great idea on Pinterest. And I pinned this recipe! Haha it definitely can! The great thing about harissa is that it can be made with any peppers you like so you can really make it to your tastes from mild to super spicy. And of course you can add a little bit or a lot to whatever you’re making with it. Red bell peppers are my favorite as well – thanks for pinning, and for linking up some great recipes! I just made a batch of Mourad’s harissa! I love the smoky, spicy flavor. I have never tried other versions, though, so I can’t say how it compares! Oooh I’m sure his harissa recipe is incredible. I’ll have to try that next! I have bought this before, but clearly your homemade rendition is much better. You have done quite a bit of research to get this just right, so I am sure I would enjoy it. Nice of you to sponsor this blog hop, I need to look into some of those links. Have a great weekend! Thanks Tina! I agree homemade is usually better whenever possible. My favorite part about making it is that you can really customize the heat and flavor. Have a great week! I am so impressed! Harissa is incredibly delicious. I can’t believe you made it yourself. Fabulous. I once had harissa mashed potatoes at a restaurant – probably one of the most amazing meals ever. Aw thanks Dara 🙂 I need to go out and make some harissa mashed potatoes – that sounds like the best thing ever! Let’s see – does MJ like peppers? 🙂 Another great topic for a blog hop Katherine! I couldn’t decide whether to link to my New Mexico Red chile pepper post or the Green Chile pepper post, so I just uploaded both. I hope you don’t mind. I love your harissa! I’m going to share that on my FB page right now! I’ve never used caraway seeds in a pepper sauce of any kind so I’m very curious as to how it changes the flavor that I’m use to. I’m definitely going to try it! Also, as you pointed out – you really need to toast the seeds! Great blog and keep up the good work. And Check out the new and upcoming food critic at http://www.seacoastfoodcritic.com​ and please feel free to comment on a post. I can only imagine the complexity of flavor in your homemade harissa! Thanks for sharing. This is brilliant! I bet it’s SO much better than the store bought. I’ve also read that dry roasting whole spices then grinding them makes a much better blend! Thank you Ann!! I like to think it’s better than store bought 😉 And dry roasting whole spices really does add a whole new level of flavor, it’s amazing! This is my weakest spot in cooking – the spicy hot sauce and all kinds of spicy ingredients. But my husband loves it and enjoys it. No links from me, but I enjoyed looking at the varieties here. Yes, spicy isn’t for everyone. I hated spicy things as a kid but now love the heat! Looks great and I am sure is so much better than the store bought kind. The photos are gorgeous!!! Oooh, I love harissa! This looks absolutely delicious! Oh wow, homemade harissa. Brilliant!! I would have never thought of making my own but now it makes perfect sense. The flavors must be so vibrant. Great post. I’m saving it. Oh my goodness … this sounds so delicious … and so easy! I truly can’t wait to give this recipe a try … my hubby loves everything spicy and I know he’ll love this! It is easy and delicious! If your hubby loves spice then he’ll love this – and you can really play around with what peppers you include to amp up or tone down the heat. I hope you enjoy – let me know how it turns out if you make it! but why do people always exclude Libya . It is a North African country . And they eat hareesa more that Algerian and Moroccan people do . Thank you Mary!! And you are so right about Libya (according to Wikipedia Tunisia is the biggest exporter of pre-made harissa but that’s neither here nor there). That is great to have a recipe for harissa because often here in Sydney I have trouble finding it. Like you said, it really is a very handy paste to have on hand because it is so versatile. Yours looks fabulous – very firey! Great recipes, must have a delicious sfragrance! Sounds beautiful! Can’t wait to try it out! Hi, I’m come over from celi’s blog, and I’ve enjoyed reading your thought process on trying to find an Harissa recipe, it’s akin to something I went through a few years ago! I like your addition of lemon juice, so I’ll have to give that a try next time I make a batch. 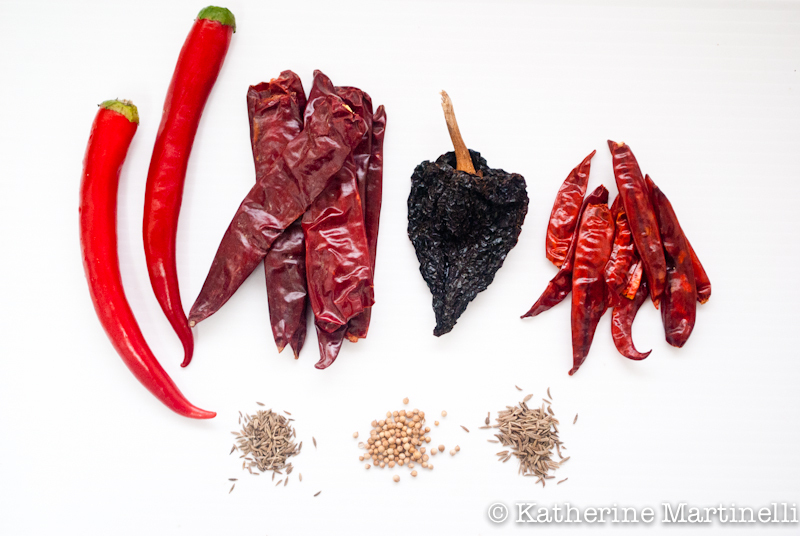 One thing I have found is that the heat of the chillies can vary hugely, making it a rather “exciting” recipe to make as you never quite know how hot it will be! It also seems I managed to add my link wrongly so the name appears as me instead of the recipe for Chili Jam 🙂 ! Thanks so much for your comment Claire! The flavor of the lemon juice is subtle but it does add a nice little zing. And you are so right about the heat of the chilies varying tremendously. Each batch is unique as a result! Also I’ve fixed your chili jam entry and pinned it. Thanks for linking up! I never thought of making harrissa from scratch, but I absolutely love it, so if one day I want to face this challenge, I’ll use your recipe for sure! Thanks so much Sally! I’m glad that our taste buds align 🙂 And making harissa from scratch isn’t the challenge it would seem to be. I do hope you give it a go! Thanks so much for stopping by! Would love to try your version of Harissa. I am sure it will beat the canned version. I need to hunt for all the variety of peppers that you mentioned! I hope you give it a go! Don’t worry about finding the same variety of peppers I used – any dried peppers will work well and you can decide how spicy you want to make it! I can’t wait to try this. I have a recipe for couscous that uses harissa and it’s on my menu this week. The timing could not be better! Wow, this sounds tasty and spicy, my kind of hot sauce, love it. Congrats on the Top 9, well deserved. Katherine,Did you really eat this? My husband loves all kind of spicy things. Haha I did! It was all gone in about a week… If your husband loves spicy things he’ll love this! Nice recipe. As far as I can tell, Harissa is one of those concept recipes: almost anything can go, because – depending on what country you’re in, and what region of that country – it’s made in so many ways. In Morocco Harissa tends to be pretty simple, at least in my experience – dried peppers, some garlic, salt, and oil. Maybe some cumin, maybe another spice or two – but that’s it. I think the Tunisian Harissas are more elaborate (and I think they sometimes do include roast red pepper – too much trouble for me!). Anyway, great job on this – thanks. Thank you! It’s definitely true that harissa is different wherever you go, which is one of the things I love about it. And since the peppers can vary so much every batch is a little different even with the same recipe. I’m really happy with this recipe, but do think I’ll try making it with roasted red pepper as well at some point for comparison. I’m not familiar with samba belachan (is it anything like samba oolek?) but I bet I would love it! Yes, if you like spicy food you’ll definitely like harissa! Harissa is wonderful and I love your description of the flavors. What a marvelous recipe! I look forward to trying it. Thanks for the invitation to link up pepper recipes – I look forward to checking them out. I’ve never tried harissa, but by the looks of it we would love it! Your harissa looks fabulous Katherine!! I’m a bit of a chilli wimp though so I use bell peppers to lessen the heat. I’m so happy to have introduced you to harissa!! It’s really wonderful and, you’re right easy to make once you get the peppers. Thanks for featuring me in your roundup! I love how you described your research. I was looking at some of the very same recipes that you mentioned when I stumbled on yours. My final recipe may come close to yours, depending on available ingredients. I’m an American expat living in Al Jouf, Saudi Arabia. Not many expats live here, so we eat a lot of chicken and we try to change up what we do to it and how we flavor it. Thanks so much Anita! Glad yours came out nicely. Living there must be such an interesting experience! I know that I’m also always looking for new and interesting chicken recipes. Harissa can definitely be put to use to spice up chicken in a number of fun ways. Bon appetite! harissa is for sure originally from Tunisia, they have fields of of it growing there and drying it and smoking the peppers that originated from the 1500’s from latin america, some say its algerian or libyan or moroccan but by far the hottest and most authentic flavor is from Tunsisia, also you are right, the most exported pre made harissa is from cap bon in Tunis where a lot of jews live too, but it originated in the souther of Tunisia. It’s definitely not Moroccan since they have a lot of sweet and sour flavors whereas Tunisians have nearly hot everything, it’s just easy for anyone to call nearly everything that is North-African Moroccan because its most familiar. Also i might add that Paula Wolfert has books about Moroccan food and she is an expert on Morccan food as well she says in her books that Harissa was nearly nonexistent in Morocco untill recent years, so its probably Tunisian….even though Libyans have their own variaton of this called sghug, but its not the same though, good recipe keep it up mate! Forgot to mention that even Couscous is not Moroccan, but a berber dish and berbers are found all over North-Africa. From Mauritania, to Morocco all the way to Tunisia and Egypt, but like i said its easier to associate with Morocco because its the most known country in North-Africa, Egypt beeing excluded mostly because they don’t see it as part of the maghreb. Tunisia Algeria and Morocco are the most famous…morocco standing out. i have a school project and i want to make this but my question is what would go well with it? Just about canned harissa… In the USA, we are rejecting canned foods because most of it is rotten, and because it ruined like three generations of cooks. But there are high quality canned foods. In Spain, you can pay forty dollars for a can of mussels. Harissa is one of those things. I have a jar at home that has no preservatives, comes straight from Algeria, and tastes incredible. The process of canning changes the food, but not always negatively.